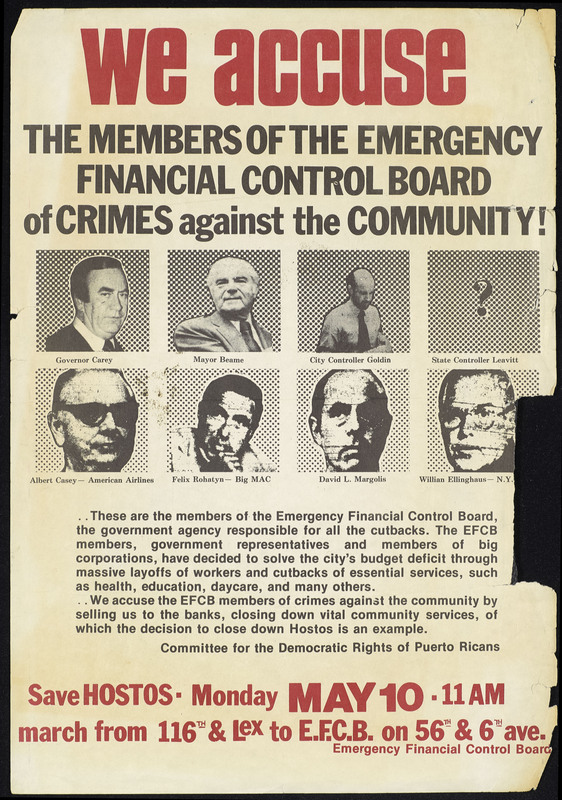 “We Accuse The Members of the Emergency Financial Control Board of Crimes Against the Community” flyer was created by the Community Coalition to Save Hostos (CCSH) for the May 10, 1976 march that proceeded from El Barrio to the headquarters of the Emergency Financial Control Board located at 56th Street and Sixth Avenue in Manhattan. The Emergency Financial Control Board (EFCB) was formed in fall 1975 to make difficult funding decisions regarding city expenses. Many measures were taken to control spending, including cutting the budget of the City University of New York (CUNY). One of the EFCB’s decisions was to close Hostos Community College and merge it with Bronx Community College which clergy, students, faculty and community members actively opposed. Ultimately, through actions such as letter writing and community outreach, CCSH, Save Hostos Committee and several subcommittees were successful in saving the college from being closed. Cite This document | Community Coalition to Save Hostos , “ "We Accuse",” CUNY Digital History Archive, accessed April 25, 2019, http://cdha.cuny.edu/items/show/7492.